As Guns N’ Roses prepare to kick off their Australian tour in Perth on Saturday, leader Axl Rose has given a rare interview to Adelaide Now to promote the shows. Among the subjects discussed in the session are the Rock & Roll Hall Of Fame induction that Axl boycotted, the possibility of new GNR music in 2013, the late starts to the band’s shows and, of course, talk about a classic GNR reunion. 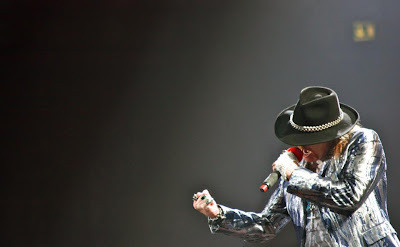 Read the full session with Axl at Adelaide Now here.